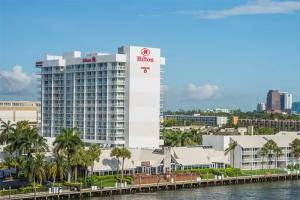 The Hilton Fort Lauderdale Marina offers a spectacular, resort-style getaway in the heart of the "Venice of the Americas." Set along a scenic stretch of the Intracoastal Waterway, the hotel has its own 33-slip marina and many of the well-appointed guest rooms offer balconies with beautiful water views. Relax around the graceful curves of the swimming pool or walk to shops and restaurants. Bicycle rentals offer additional options, as does the Water Taxi stops at the hotel, and the beach shuttle that whisks guests to the very best stretches of sand nearby. Fort Lauderdale Hollywood Airport is located 3 miles from the hotel.